But after testing it out at the Microsoft Store last week, I was pleasantly surprised by the experience and decided I had to bring home both the pen and the tablet to give them a proper workout. Huawei has definitely borrowed design cues from Apple. The bezels are significantly narrower on the Matebook (top) than the Surface Pro 4. The 12-inch Huawei Matebook is the Chinese manufacturer’s first Windows tablet and the device feels like the love child of a Surface Pro 4 and my Space Gray iPhone 6. Only 6.9mm thick and weighing 640g, the Matebook is approximately 18% thinner and lighter than Microsoft’s 2-in-1. The Matebook measures 278.8mm x 194.1mm and is slightly smaller than the SP4, which measures 292.10 x 201.42. Much of the size reduction seems to be due to the Matebook’s significantly smaller bezels, which are about half the width of the Surface Pro. The display is 2160 x 1440 IPS TFT LCD with 216 PPI. Not as stunning as the 2763 x 1824 (267 PPI) screen on the Surface Pro but very nice nevertheless. Powered by 6th generation Core m processors, the Matebook is available with either 4 or 8 GB of RAM and 128, 256 and 512 GB SSD. In order to test it out head to head with my m3 Surface Pro 4, I opted for the base model, which retails for $699 plus $59 for the Matebook Pen. 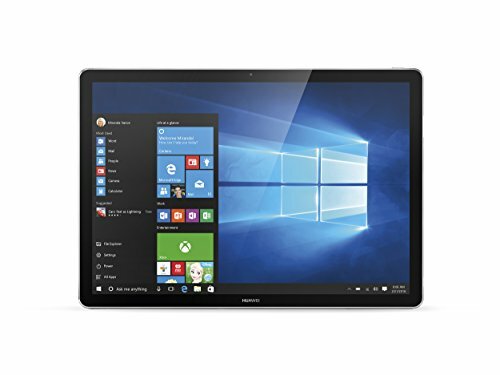 A comparable SP4 is $899, or $141 more. You’ll likely need to spend another $89 for Huawei’s MateDock accessory which adds HDMI, VGA, Ethernet, and two USB ports. A Portolio Keyboard retails for $129. I opted not to buy the keyboard because its iPad-like folding stand doesn’t offer the proper angle or enough support for drawing with the pen. The couple of times I’ve had to type something so far, I’ve connected a spare Bluetooth keyboard to the Matebook. Unlike many Windows tablets (including the Surface Pro), the Matebook is a pleasure to hold and it’s not difficult to imagine cradling it for long periods of time while drawing. With smooth, rounded edges interrupted only by the keyboard connector on the bottom and the USB-C port on the lower right, the Matebook is elegant and silky to the touch. The retail packaging and cabling is also very Apple-like, with a Power Adaptor, USB-C Data Charger Cable, USB-C to Micro-USB Cable, and a Micro USB to USB-A Adaptor, all white and attractively wrapped. The MatePen includes a replacement nib. A fingerprint scanner is located between the volume up and down buttons. Between the volume up and down buttons located on the upper right side of the tablet is a Windows Hello compatible fingerprint sensor. Once you set up your device, it’s great to login with a light finger-press. The processor in the Matebook I purchased is the same as the Intel Core m3-6Y30 running at .90 GHz on my Surface Pro 4. The Huawei performed slightly better in both the PCMark Creative Accelerated and Conventional benchmarks. I really have no complaints with the way the Matebook performs any day to day tasks either. The narrow bezels did make it slightly less reliable to swipe in from the top, bottom or sides, but that’s not a major issue. As you’d expect from an m3 device, the Matebook is fanless and completely silent. It can get quite warm to the touch after continuous operation. The heat isn’t localized but spreads across the back. Huawei claims that the Matebook will deliver 10 hours of battery life, but while I haven’t timed it exactly, I’ve experienced no more than four or five hours before draining the battery to perilously low levels. Turning to the MatePen, the smooth barrel is slightly thicker than the Surface Pen’s. A ribbed white grip sits between the pen buttons and the cap. Although the grip definitely makes it easier to hold the pen, it would seem more functional to me if it were lower on the barrel. The MatePen is rechargeable via a hidden Micro USB port. Huawei claims the charge will be good for 100 hours. The MatePen does not require a AAAA battery. Instead it is rechargeable via Micro USB. To access the charging port located inside the pen, you have to yank the end hard. Despite having pulled it off half a dozen times while testing, it still requires a lot of effort to separate the end from the pen. Instead of housing an eraser, the pen cap contains a laser pointer, a feature I know I’ll never use. The lower-most pen button is pre-configured to Erase. The upper button right clicks. The pen can be paired. Hold down the two buttons until the LED indicator on the pen grip flashes. In the Matebook’s Settings under Devices ->Bluetooth, select the MatePen and Pair. This step isn’t necessary for drawing and inking, but once paired, pressing the upper button once will advance PowerPoint slides and twice will launch OneNote. Pressing the lower button once will go to the previous PowerPoint slide and pressing twice takes a screenshot. The pen features two pre-configured barrel buttons and includes one replacement tip. The nib can be replaced, but it is somewhat counter-intuitive, as it requires twisting the end in a clockwise direction as if to tighten. Reseating the tip can be tricky too. The first couple of times I tried, the tip’s white collar wouldn’t sit flush against the barrel end. The blunt shape of the tip and large white collar seemed really off-putting at first glance, but in practice the pen performs really well. Huawei doesn’t provide any specific drivers so you are stuck with the button presets. Without a Wintab driver, you’ll be out of luck with the Matebook if you are looking to run Paint Tool SAI, ZBrush or older versions of Photoshop. But in my tests with Sketchable, Clip Studio Paint and Photoshop CC 2015.5, the tablet and pen performed very well. Pressure sensitivity will be limited to programs that don't require a Wintab driver. I thought I’d be put off by the hard plastic nib on glass tactile response, but I’ve been pleasantly surprised that the tapping is not as loud as on other devices. The pen also seems very accurate despite its large nib area. Huawei claims the pen is capable of delivering 2048 pressure levels and pressure response is very nice, transitioning smoothly from very light lines to medium to thick. Drawing quick C shapes, I noticed a little bit of quantizing (straight segments along curves) but they did not occur often or predictably. Looking into the pen’s Hardware ID, it appears to be manufactured by Wacom and performs very similarly to other Active ES pens. 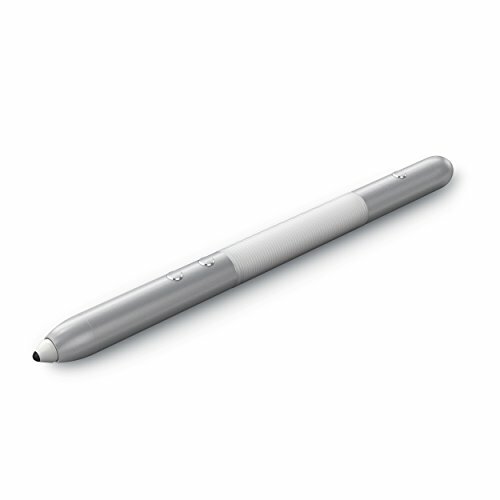 Could this be the forerunner for what Wacom has in mind for its upcoming Surface Pro-compatible dual protocol pen? UPDATE: The MatePen is compatible with other Wacom AES devices like the Lenovo Miix 700, but the results aren't consistent, producing broken strokes on the Miix but excellent results on the Thinkpad Yoga 14. The Matebook's folio keyboard support isn't sturdy enough for pen use. You can bog the machine down once your project size begins to exceed the available RAM. Very large textured brushes can also lag badly. I generally test with 15 x 10-inch canvasses at 600 dpi and regularly use 18-100 pt. brushes with a dozen or so layers and only experienced momentary slowdowns while saving my files. You’ll see improved performance with an m5 or m7 version of the Matebook, but if you’re really after performance, an i5 or i7 device is probably a better bet. So should you consider the Matebook and MatePen as your next mobile sketchbook? Absolutely. Is it a no-brainer if you also need a robust two-in-one? Unfortunately, no. The lack of a kickstand and the flimsy portfolio keyboard should give you pause. The external dock for basic connections is also a negative to consider, as is the poor battery life. But the Matebook is an excellent first effort and it’s very exciting to welcome Huawei into the family of Windows tablet makers.